Well, that was fun! We had such a great Christmas here and I’m hoping the same for you. But it’s time to move on to what for me is the funnest week of the year...between Christmas and New Years. We do a lot of partying during this week around here and keep ourselves entertained with bowl games and football pools and lots of fun party food. Over the years I’ve amassed quite a collection of party app recipes and this year I’ll be adding these yummy little sausage roll bites to the list. I found the recipe in the New York Times (David Tanis), and it took me no time to get them made up. I loved the story behind these little rolls, which are British in origin, and are traditionally made for Boxing Day (the day after Christmas) when all of the servants were given the day off. Seeing as how my servants were going to be taking that day off as well, I thought I’d make up a batch for the household. Actually my servants have every day off. Bah! 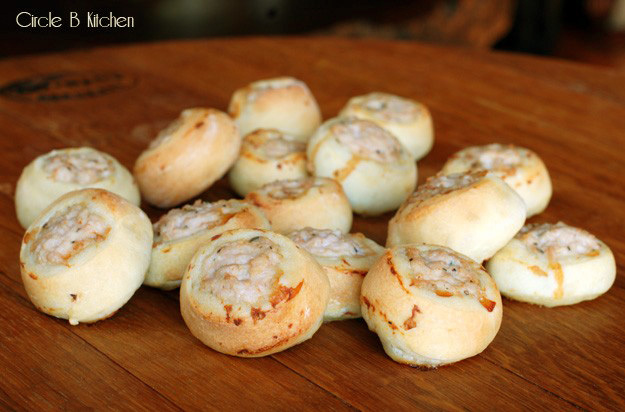 I don’t know if this happens to you, but sometimes when I look at a food photo, I often make assumptions about what I’m looking at based on what I subconsciously hope it actually is, and in this case, I totally thought that these were made from pizza dough or bread dough of some kind. But in reality, they were made with puff pastry. A little research confirmed that Boxing Day sausage rolls are indeed made with pastry dough, but I still wanted them to be made with pizza dough so that’s what I did. And we loved them very much. You could, of course, make them with puff pastry or pie dough or whatever dough you like, really. Mr. Tanis made up his own sausage mixture, which I would like to try sometime. But being a bit pressed for time, I thawed out some Italian sausages I had in the freezer, removed the casings and just laid them on the dough before wrapping and slicing them up. So, so easy. Then it’s just a matter of baking them and getting them out on some platters, definitely to be eaten warm from the oven. We dipped them in mustard which seemed rather perfect. The original recipe as written in The Times uses a homemade pastry for the rolls, but this can be subbed out with frozen puff pastry sheets. I used ½ recipe of my homemade pizza dough, but store-bought pizza dough would work great too. I’ve provided a link to David Tanis’ recipe in case you would like to make his sausage filling, but for simplicity’s sake, I just used link sausage with the casings removed. You could also use bulk sausage and form it into a 1-inch diameter roll. Sprinkle your counter with a little flour and roll out your pizza dough to just under 1/4 –inch thick and cut into 4 rectangles, each about 8 inches by 4 inches. Working with 1 rectangle of dough at a time, lay the sausage in the center of the dough. It should reach to the ends of the dough, so trim off any excess. Pull the dough up over the sausage and crimp the edges closed to fit tightly over the sausage. I rolled it around a bit on the counter to make sure it was tightly sealed. Using a sharp knife, cut your roll into 1-inch slices and place them on a parchment-lined baking sheet. Brush the dough with a little olive oil and sprinkle with a little kosher salt if desired. Repeat with the remaining pieces of dough and sausage. Bake for 25 to 30 minutes or until lightly golden brown and cooked through. Let cool briefly before serving warm with mustard for dipping.